Bruce Katz launched the Samuel Hubbard Shoe Co. When Bruce Katz (right) and his father Saul sold the Rockport Co. to Reebok, it seemed like the end of the Katz family’s history in the shoe business. That was 30 years ago. 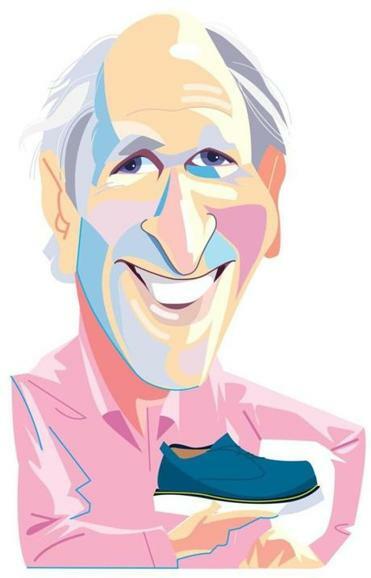 Katz departed Greater Boston for the San Francisco Bay area, to dabble in ventures ranging from bikes to solar panels to high-tech startups. There wasn’t a last or midsole in sight. But the shoe bug never really left him: Egged on by his daughter, in 2014 Katz launched the Samuel Hubbard Shoe Co., based in Mill Valley, Calif. The general vision? A continuation of Rockport’s, with a focus on dress shoes that would stand out for their comfort. In its second year, Katz says he expects his company to reap about $12 million in revenue — a mix of direct-to-consumer sales and shipments to shoe shops, places such as the Tannery and Shoe Market. There’s also the occasional celebrity sighting: Bill Clinton was spotted walking around Manhattan in blue Hubbards this month. Among Katz’s colleagues in this new venture are people he knew from Rockport: Werner Wyrsch, formerly head of Rockport’s manufacturing, and Claudia Stroud, now Katz’s EVP at Hubbard. Retailers were initially skeptical that they could sell shoes priced at more than $200 a pair. But Katz, now 69, says he has proven that the skeptics were wrong. The company’s name refers to the Hubbard Shoe Co., a children’s shoe factory in Rochester, N.H., that Katz’s grandfather Samuel opened in 1930 and his father later ran. Katz has fond memories of the place, which closed in 1973. Katz’s father didn’t live to see his son revive the name, although Katz floated the idea by him. In real life, Berkowitz said he is a registered Independent and plans another equally edgy advertisement when the Democrats hold their convention next week. Eric Rosengren has a great view of Boston’s economic boom from his windows on the 32nd floor of the Federal Reserve Bank of Boston. But the Boston Fed chief executive knows that Massachusetts’ success doesn’t just depend on Boston’s. Many of the state’s 20 or so mid-sized cities are struggling, with average family income falling behind the nation’s. Rosengren and his team engineered a program aimed directly at addressing that trend: the Working Cities Challenge. On Monday, they hosted winners in this competition’s second round at the Boston Fed tower. Each winning city – Haverhill, Lowell, Pittsfield, Springfield and Worcester – won grants valued at $475,000. Their differing programs shared similar goals: fighting poverty and improving economic opportunities. The money came from state government, the Massachusetts Competitive Partnership and several foundations. State Senate President Stan Rosenberg, MassDevelopment CEO Marty Jones and Jay Ash, Governor Charlie Baker’s economic development secretary, were among those on hand to celebrate. Also speaking: State Street Corp. CEO Jay Hooley, a Partnership member, and Partnership CEO Dan O’Connell. The Boston Fed recently launched parallel programs in Connecticut and Rhode Island. Making objects in a 3-D printer isn’t as simple as it seems. Many complex printed parts need hours of sanding, soaking, or other “post-processing” before they can be used. Frank Marangell plans to change all that. His new Woburn-based company, Rize, has invented a 3-D printer that makes parts that are instantly good to go. “It’s like taking the cake out of the oven already decorated and ready to use,” said Marangell, a Connecticut native who holds a degree in industrial engineering and an MBA from Northeastern University. Marangell first got into 3-D printing a decade ago, when he helped set up the Billerica office of Objet, an Israeli 3-D printing company that has since been acquired by Stratasys Ltd.